I opened my eyes to embrace a lovely morning, and the splendour of the Sun's rays was without comparison. Its rays were permeating the openings of my old curtains, and I felt like cuddling my pillow so hard and sleeping some more. Just then his voice stormed my room. The approved list has been pasted! Kennedy said to me through the window, as he crossed by my apartment. His message kept oscillating in my mind, I was elated and my heart skipped beats. I prepared immediately and dashed to the University notice board, situated few kilometres away. When I got to the board, I looked with utmost focus at the pasted long list of names, it was printed on an A4 sized white paper. Just then I used my index finger to move serially across the names on the list…. In search of my name. Geez, I can't believe it! That's my name at no 17. The university senate has approved my result and has shortlisted my name among the students ready to serve the fatherland for a year. A dream come true, as every Nigerian graduate would feel totally incomplete if he or she does not participate in the National Youth Service Corps (NYSC) scheme. Some stratum of the Nigerian society believes that you are actually a graduate, only when you pass through the NYSC scheme. Without the NYSC participation evidence after graduation, one isn't eligible for employment in any governmental position across the length and breadth of Nigeria. Happily, I called dad and mum, my siblings, mentors and friends to share the wonderful news... Congrats they all said to me. Corper Rex! My friends hailed me... And I smiled optimistically. So very soon you will start receiving the monthly salary (allowee) paid to every fresh graduate? Stella asked as she looked at me with eyes beaming with wild excitement. Yes dear, I quickly replied. Stella was my departmental junior colleague. She has always been optimistic and never hesitated to stop me with academically related questions whenever confused. Even in the school walkways, she was ever inquisitive. I really admired her courage and perseverance because most campus girls were head over heels and preoccupied with fashion and Whatnots. I took my time, I swaggered to "Madam Do well Eatery" and ordered a pizza… What shall a man do if not eat and merry when things go according to plan? My case is different but does not exclude merriment… I said to myself, as I guzzled a bottle of chilled coke. Since my first year at the university, I was academically conscious at the extreme and never participated fully in most extracurricular activities on campus. Finally, I have all the time for merriment… I thought. No classes, no lectures and above all no more exams. But would life ever give me my so desired freedom? A few weeks later, The NYSC, management stated that every eligible candidate should mobilise for the NYSC orientation program. After which the one-year mandatory service for every fresh graduate would commence in full. As I neared the cyber café to register. I was hearing responses of dissatisfaction from fellow prospective youth corpers who wanted to mobilise online. I was perturbed, what could it be? I thought within me. The Hausa graduate, a young boy said in all seriousness, I don't want to serve in the East... Their arrogance and intimidation are too much...walahi! The west is manageable. The Yoruba graduate a young lady, refused serving in the North but partially wanted a southeastern state. But would be happier if posted to the neighbouring southwestern State. I as an Igbo graduate was not left behind, as I muttered indecipherable words against them, as I sat amongst them. Do they think I would gladly stay in their land? My parents, already swore I would never serve in a northern state due to the unimaginable heights of violence by the Boko haram miscreants and their gullible cohorts, a southwestern state will be partially accepted although a southeastern state would be most preferable. Everyone wanted to stay possibly in their state of origin and neighbouring states. Except for the few adventurous graduates. At that spot, I discovered that Nigeria was one to people who are speculative-theorists, but actually not one when viewed from a pragmatic perspective. Which involves an acid test, exposing our patriotism to test. Something to really ponder about. Notwithstanding our differences stemming from our differences and variant life values, the NYSC did the unthinkable. They shuffled us all, Northerners were posted to the South and vice versa. Just a few people were lucky to stay close to their state of origin, but not in their state of origin. Except on serious grounds based on health or marital background, no one can stay back and serve in their state of origin. I printed my NYSC call-up-letter, weeks after the online mobilisation and I was posted to a South Eastern state-Ebonyi State. Could I say it was sheer luck, computer error, destiny or answered prayers? All of the above, the answer remains inconclusive. Finally, I won't have to argue with my parents, as they were very happy when they heard I was deployed to a close by state. When I got to the NYSC orientation camp in Ebonyi state, Old MacGregor College Afikpo. I registered, signed the NYSC undertaking form and was assigned to a particular platoon, mine was platoon 5. I was given several items including the NYSC books, a kit containing clothes and shoes. I was subconsciously forced to communicate with various people of diverse belief and value systems. On arrival, a Hausa boy Abdul become my tight best friend. I have always seen the north as brutal and inhumane in dispositions. But here I am…..seeing and doing things contrary to what I was taught and indoctrinated. Abdul actually proved the opposite. Is this a dream or reality, or as a result of opportunity? My mind began pacing on questions which do not exclude, the actual agenda of the NYSC scheme, in the life of a Nigerian graduate? This should be demystified… I thought, already lost in an ocean of curiosity. I opened my box, in search of my phone charger, then my eyes were drawn to a particular book I had already carefully buried inside my box cavity. I brought out this book given to me at the NYSC orientation camp on the first day of my arrival. To develop common ties among Nigerian youths and promote national unity and integration. To remove prejudices, ignorance and confirm at first hand the many similarities among Nigerians of all ethnic groups." I nodded in affirmation, closed the book, and looked through my net sealed window to see what was going on outside. Immediately, I saw troops of army officers coming into our hostel at the camp. "All Corpers! Should exit this hostel to the parade ground! If you are found in the hostel, you are WRONG!" We trooped out of our hostels in haste… while wearing the NYSC cap, white round-necked polo, white shorts, white socks and canvas. And as we moved out, some were carrying their canvas and singlets in their hands. A funny sight to behold, due to unpreparedness at the moment. "Double up! Double up! Otondos! You must be ready at all times! You must march at twice the normal speed! I took off with my mates and in minutes I was standing in a straight line with others. You must obey every single rule in this camp or your parents won't recognise you after this camping. If you think you are a witch, am into witchery. Otondos! You must be doubling at all times. Your status and educational background mean nothing in this camp. Every camp official must you obey! Are you arrogant? Hope you dropped it at home? Or, I will cut your tails off! You people should sit up during this 3weeks camping period, do not mess up! If you know you are not mentally and physically fit better meet the medical consultants and prepare to leave this camp immediately. We want no weakling, here…"
Commandant Sa'ad said as he addressed us while moving like a wounded lion, looking for whom to devour. Yes, Sir! We answered in unison, in acknowledgement of his admonishments. Was this what we signed for? We asked each other. Although they never manhandled anyone, but their punishments in disobedience and orders in activities, were second to none. The next day we were inaugurated, we no longer answered prospective corps members but we were now full-fledged Youth Corpers. We were excited at this development and we took lots of photos in our "7 over 7" which was our Complete NYSC regalia. We were made to understand that we are currently the government's property and responsibility. We were taught to serve our fathers land both in the Sun and in the Rain, with service and humility. And to sacrifice our lives for our beloved fatherland if need arises. Nigeria is ours, Nigeria we serve." We were made busy every hour of the day. Activities were compulsory for all. This includes platoon parades, lectures, sanitation, kitchen duties, skills acquisitions, Man 'O' War drills, sports, entertainments (music, drama, dancing, cooking competition, and carnival). Some people got exhausted and collapsed. In extremely severe and rare cases, death was recorded. The Red Cross and medical consultants were always around us like houseflies, waiting for the unexpected casualties. No wonder the NYSC officials included the certificate of medical fitness as a prerequisite for camping registration. We were given life-changing lectures, all aimed at moulding the crude end products of Nigerian tertiary institution to fine products expected to be in the Nigerian society. The spirit of environmental adaptation was inculcated in us. We were cautioned to not indulge in acts that can tarnish our image in the camp. Reminding us that we are all ambassadors of our respective families. Some later threw caution to the whirlwind. A boy and girl were decamped when they were caught in the bush at night, doing the act. Some boys indulged in the smoking of Indian hemp and some ladies saw indecent dressing as a priority. They were asked to remove their names from the camp book of life. Moral Decadence among the Youths. Since they could not prove that the Tertiary Institution they graduated from, that approved them to be found worthy in character and learning, did take the Right step. We were made to understand that certificates are not what the society actually needs. The society was in dire need of our meaningful contributions in any area we have laid our passion and devotion. We were reminded of several great men who made it despite their low background, low education status and hindrances. If they did overcame, what about us who are more equipped than they, during their days. Life and the society only recognise our valuable contributions not the accumulation of degrees. For your valuable contributions, you are rewarded. We were encouraged to impact positively in our areas of primary assignment, using judiciously both the personal and group community development service (CDS) scheme after the camping. The reward of such includes national awards. As I sat down in my hostel and reflected over all these indelible scenarios, I came to realise that there is more to the NYSC scheme than it may simply appear to the uninformed. The days fleeted by, the hours was in rush, the minutes and seconds were hastily racing after them. Subconsciously, activities winded off the frame of time and the camping end was almost attaining a close. 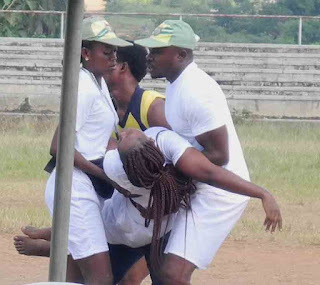 Various allowances were paid to the Corpers as they were about to exit the camping ground. On the last day, the last camp parade was conducted. Every one of us was issued a posting letter that indicates the place of our Individual national service for the next 11 months. Although some were issued a relocation letter based on tangible reasons. We finally left the camp and moved to our places of primary assignment. "Now the Journey continues, there was never a free moment after all. Any moment we feel we were free, is as a result of being myopic of the next challenges ahead. For life never gives an actual rest, except in death"
Being a Youth Corper is a once in life activity. My Faith has to be, beyond my Fears.